It has been widely accepted that iMovie is a great application which lets Mac users import and arrange the videos recorded, edit the home videos in the simplest way and turn them into a movie, or even fine-tune the cuts and transactions, fix shaky videos etc. However, there is still ONE shortcoming. Videos in only limited formats are supported to be imported into iMovie. Full iMovie video formats are listed below. Free convert VOB to MP4 or MOV that iMovie recognizes with best free iMovie converter. Just a click away and you can convert WMV for further video editing with no quality loss. Before importing the footage to iMovie, people need to make sure it is in one of the supported formats, otherwise it will not be recognized by iMovie (iMovie ' 11 included). Therefore, if you wish to import some videos incompatible with iMovie, for example, if you want to import WMV to iMovie, it is necessary to use a third party WMV video converter beforehand. Among all the professional software, MacX Video Converter Free Edition is one of the most excellent and reliable choices to free convert WMV format to iMovie on Mac. This free video converter offers a lightning fast conversion speed to finish the conversion process, while keeping a lossless video quality for you to import WMV to iMovie for editing it in iMovie later. This program is also capable of converting all popular 4K/HD(High Definition) and regular videos, such as WMV, MKV, M2TS, AVI, FLV, MPEG, RM etc to iMovie video format. With the help of this iMovie video converter freeware, you are able to convert video to iMovie on Mac without any hassle, just sit back and then import the converted video into iMovie right away. Besides, WMV video conversion can also be realized on Windows PCs with the advanced edition in Windows version - MacX HD Video Converter Pro for Windows, which allows you to convert WMV, AVCHD, MTS/M2TS, MKV HD videos to iMovie sopported formats. 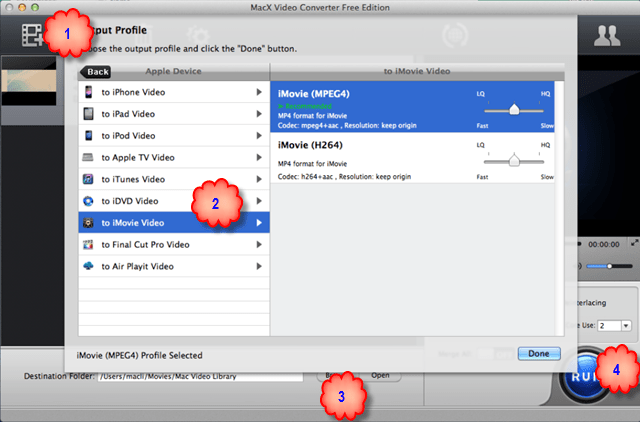 How to Free Convert and Import WMV to iMovie in Compatible Formats? Free download this high-class converter for Mac and run it. Click "Add File" button to browse the WMV video files saved in the hard drive and to load the video and then the software will analyze it soon. Alternatively, you may simply drag and drop the WMV file which you want to convert to iMovie. Select "iMovie" profile in the output format area. You may use the default parameters or adjust the audio and video parameters there as you wish. It is designed with an intuitive interface and high quality engine to give you a good experience to convert WMV to iMovie. Click "RUN" button and the conversion begins. Sit back and the software will run smoothly to convert WMV to iMovie video format and the whole process will only take a few minutes. If you hope to convert all the popular video files to be compatible with iMovie, iTunes, and convert HD and regular videos for playback on Apple devices like iPad, iPhone, Android or Windows tablet etc, the premier edition named MacX Video Converter Pro is worth a try. Built in 420+ video/audio codecs and advanced HD video decoding engine, MacX Video Converter Pro will bring users an all-in-one video converting solution with top quality, easiness as well as fast speed.